The development company of Conifer-LeChase in Rochester, New York recently began plans to develop the back lot area of the old Corpus Christi School. Before they could finalize their plans however, they needed to discover if there would be anything in the ground that would be hazardous when hit. 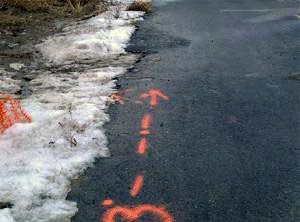 To find out if any underground storage tanks, or utilities were in the area they called on GPRS to use ground penetrating radar to find and mark out all anomalies in the area. Jim Bell of the Upstate, New York office mobilized to the site and began marking out all of the utilities that were located near that portion of the plant. In addition to finding underground utilities, and storage tanks, Ground Penetrating Radar Systems has the ability to locate and map out rebar, post-tension, conduits and in some cases unmarked graves. Ground Penetrating Radar Systems, LLC. are pleased to announce the opening of an Upstate, NY office servicing the Buffalo, Rochester, Syracuse, Ithaca, Binghamton, and Albany areas. If you are interested in obtaining more information or a quote please visit our Contact Us page for a local representative near you.